Black Knight Sword isn't terrible, but it lacks originality and thought in crucial areas. 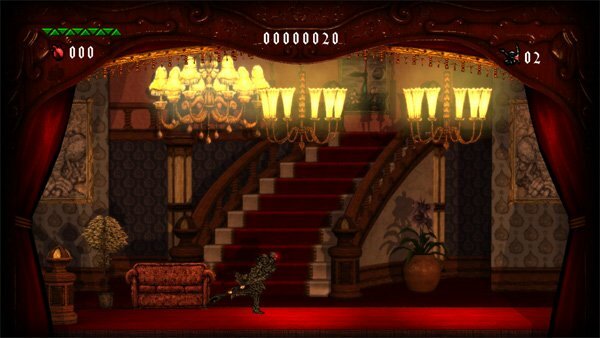 Black Knight Sword is both a retro-styled throwback to the olden days of simpler sidescrolling games and an experience similar to a bad drug trip. This is a platformer that has a very unique look and feel to it, yet brings in gameplay mechanics from the days of the NES. One of these factors, while holding true to many old games, is one that will alienate a lot of players – it’s no cakewalk. The story is actually told as a stage play at the start, with an unseen narrator popping in at certain points similar to such titles as The Gunstringer. Things start off with little explanation. We see a body hanging from a noose in a bedroom fall. Following that, someone – presumably the soul of the victim – gets up, and they obtain a suit of armor and sword to go fight evil with. Other than some throwaway storybook sequences that start out the other levels, that’s pretty much all you’ll get as setup. The presentation of Black Knight Sword is probably its greatest asset. Set on a purely 2D plane with everyday objects like microwaves strewn across the levels and numerous characters resembling cut-out paper dolls, the best way to describe it is a mix of LittleBigPlanet, Paper Mario, and a waking nightmare. Enemies include grotesque heads on stumpy legs, two-headed men who spew projectiles, and occasionally more conventional creatures, like wolves. The included level layouts look all right, but the real eye candy is in some of the background. They resemble moving paintings at points, and seeing things like an animal cutout on a stick run around behind you is amusing. If it wasn’t already clear, this is an incredibly weird game. You harvest hearts from enemies to obtain upgrades from a floating mass of eyes, you collect “Cat Head Grass,” which you can then view in a greenhouse, and a fish pops up onscreen to indicate when you’ve reached a checkpoint. It’s because of this that it’s not surprising to learn that the game was developed by Grasshopper Manufacture, a studio that thrives on making quirky and off-beat games like No More Heroes, Shadows of the Damned, and Lollipop Chainsaw. The actual gameplay is where Black Knight Sword becomes both more conventional and unimpressive. You move left and right, can slash up and to the side with your sword, and can make use of a spirit called the Black Hellebore that is given new abilities as you progress. As mentioned above, the hearts collected from enemies can be used to upgrade your armor or gain an extra life, among other things. And that’s pretty much it. The game is a basic platformer and hack-and-slash game at heart, and it never strives to be much more. While the previously-mentioned backgrounds burst with creativity, the actual levels are straightforward, and are sometimes frustrating in their layout. There are a lot of tricky jumps with spiked floors that come down to trial and error, and the game’s numerous enemies take multiple hits, so it’s easy to lose a lot of health in a short period of time. The most frustrating part is the fact that the developers chose to incorporate a limited lives system. You start out with three, and while you don’t have to start the game completely over should you run out, you’ll still be booted back to the start of the level and will lose all the upgrades you earned during your previous play through. Being able to strengthen your character continuously over time would have been a nice way of giving players more of a fighting chance with some of the game’s tricker parts, but as it is, you’re going to have to be pretty determined and willing to replay numerous parts if you want to see the whole journey through. While I have to give props to Black Knight Sword for its unique visuals, the actual gameplay could have used more polish and creativity. Those who do have a lot of nostalgia for the days of the original Mega Man or Ghosts’n Goblins might get a kick out of how it’s set up, but newer generations are probably just going to walk away frustrated. The game’s not terrible, but it lacks originality and thought in crucial areas. Old-school platforming fans might want to give it a look, but everyone else should be a bit cautious about approaching it. 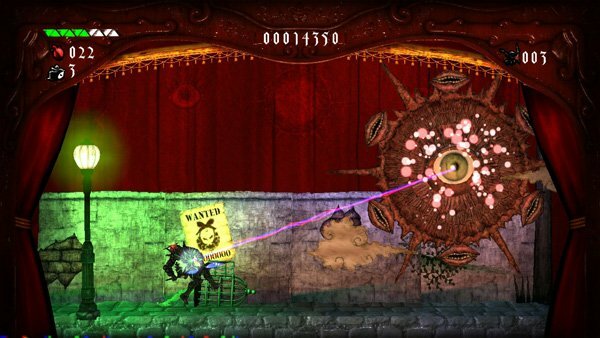 This review is based on a XBOX 360 copy of the game which we received for review purposes.